The Water Essence helps you release emotional disharmony. It allows you to let go of the past and keeps you from remaining closed off after a traumatic experience. It’s a nurturing essence that helps you become open to receiving. The Water Essence was made from an alchemic blend of two Essences – one from each hemisphere; they were prepared on the isle of Iona, on the west coast of Scotland and Heron Island on Australia’s Great Barrier Reef. This remedy allows you to intensely experience your own emotional disharmony so that it may then be purified and released. The Water Essence illuminates the conscious mind so as to reveal and initiate the release of our deepest, most ancient negative karmic patterns. It also dissolves the boundaries of a person’s perceptions and realities. It is very nurturing and cleansing and encourages us all to be more open to receiving and trusting of ourselves and feel Spirit’s love vibration that surrounds us. This Essence enables us to find the inner stillness in which to experience our feelings fully and achieve emotional harmony. It creates the deep knowing that whatever challenge that one is encountering, you will be all right. It creates the deep knowing that whatever challenge that one is encountering, you will be all right and helps one from staying emotionally closed off after a negative or traumatic experience. By taking the Water Essence first, this will help to dissolve away the limitations of where you believe you are capable of going prepares the way for the Earth Essence to then take you beyond your old reference points and limitations. The White Light Essences work best when taken individually one Essence at a time. The Essences should be taken for a minimum period of two weeks, seven (7) drops from the dosage bottle, taken under the tongue, on rising and retiring. At the end of that period you can either repeat this Essence or commence the next Essence. 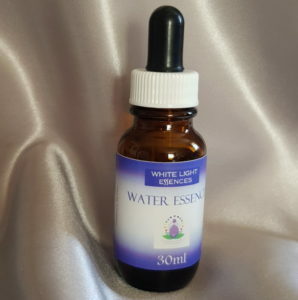 It is highly recommended that the Water Essence be the first of the seven White Light Essences to be taken, and you work through each Essence sequentially – Water – Earth – Fire – Air – Higher Self – Devic and finally Angelic. This chronology allows for the flowing expansion of our reality and consequently paves the way for fully utilising the unique qualities of the other Essences – greatly enhancing and activating them. To do otherwise will appreciably reduce the effectiveness of the results. Descriptive text supplied courtesy of Australian Bush Flower Essences, all rights reserved.